Located at the intersection of N State St and W Ramona Expy, this ACE Cash Express has a walk-in reception area and plenty of free parking. Riverside Transit Authority’s bus line #31, #32, and #74 each have a stop at State FS Ramona Expressway, right next to this location. Check RTA’s website for more information regarding routes and regulations. 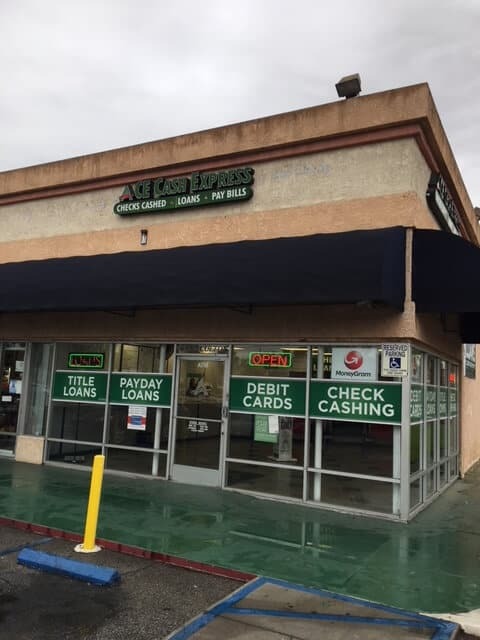 If you’re hungry, this ACE location neighbors restaurants and grocers likes Stater Bros. Market, Panda Express, Del Taco, Starbucks, Carl’s Jr, Denny’s, and Los Portales Taco Shop. Apply for an Auto Title Loan Powered by LoanMart in San Jacinto! Consider applying for an auto title loan powered by LoanMart in San Jacinto.1 Residents could get quick and affordable funding this way!1 An auto title loan is obtained by using your vehicle title as collateral in exchange for emergency funds. By choosing an auto title loan powered by LoanMart, you could receive up to $30,0001 in as little as one business day upon qualifying!3 Experience friendly customer service and fast funding! Why Choose Auto Title Loans Powered by LoanMart in San Jacinto? Funding available in as little as 24 hours after qualifying3. No penalties for making early payments5. Residents of San Jacinto are encouraged to apply for an auto title loan powered by LoanMart regardless of their current credit score.